The Buffalo Bandits (7-7) and the Minnesota Swarm (5-9) will face off in their final of three 2015 NLL regular season matchups on Saturday April 11th at the Xcel Energy Center in Minnesota. The last time these two teams met was a 2015 week 12 battle at the First Niagara Center in Buffalo where the Bandits clinched the season series against the Swarm with the hard fought 12-8 victory at home. Last week, the Bandits were faced with an important divisional matchup inside Banditland against the New England Black Wolves. Buffalo’s inability to stick to their game plan and kept the team playing catch up the entire night which cost them dearly in their chance of coming away with the victory. Because the Bandits have three out of four games left in their regular season against fellow Eastern Division opponents in Minnesota and New England, the Bandits will have to leave the disappointing loss at home last week behind them as soon as possible if they want to bounce back immediately against the Swarm. During the NLL coach’s conference call earlier in the week, Bandits assistant coach Dan Teat addressed how looking forward rather than dwelling on the past will be essential in their journey back into the win column. One of the major keys to the Bandits’ success this year has been the incredible play from their transition squad. Buffalo’s heavy handed approach to moving the ball up the floor quickly and effectively has paid off incredible dividends and the continuation of this process on Saturday will be one of their keys to victory against the Swarm. While Buffalo has been pretty healthy this past year in terms of dealing with injuries, they were dealt with a heavy blow to their depth on Friday as both forward Mark Steenhuis and backup goaltender Davide Diruscio were both placed on first-level injured reserve and the organization signing of transition player Mitch Jones and former backup goaltender Kurtis Wagar to one-year contracts to help fill the void until they return. While injuries are tough enough to deal with in the early part of the season, they can be extremely devastating when they occur toward the end when you’re fighting for your playoff lives and especially when it pertains to be your third best scorer. How the Bandits will fill the void for the missing Steenhuis will definitely be a very daunting task. With the Bandits loss to the New England Black Wolves last week, Minnesota smells blood in the water and hope to take full advantage of their wounded opponent’s two game lead for the third and final playoff spot in the Eastern Division. The Minnesota Swarm were in important divisional doubleheader action last week against the New England Black Wolves and for the team it truly was the best of times and the worst of times. With the Swarm riding high on Friday with the 13-9 victory last Friday against the New England Black Wolves, their playoff dream were immediately brought back to Earth as they were systematically dismantled by the NLL defending champion Rochester Knighthawks in their 10-2 loss on the road Saturday. In that matchup against the Knighthawks, the Swarm were held to only two goals scored with Callum Crawford scoring at the 5:28 mark of the second quarter and Ethan O’Connor putting one past Vinc on the breakaway with 32 seconds left in the game (which is a new NLL record for scoring futility). After the crippling loss to the Knighthawks, Swarm head coach Joe Sullivan and assistant coach Aime Caines reached out to their players to perform a thorough autopsy of Saturday’s proceedings to find the underlying causes for their team’s epic collapse. 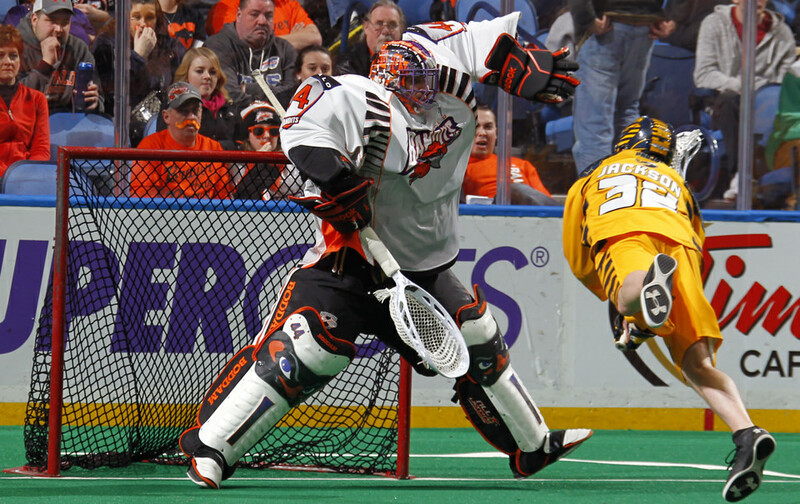 With the Minnesota Swarm trading away Logan Schuss and Andrew Suitor away to their respective teams during the trade deadline, the Bandits will have to deal with the new Swarm team chemistry created with the arrival of newcomers Johnny Powless and Joel White to the team. “Our first playoff game is this Saturday against Buffalo and we need to win this” said Caines.